Ancient Aztec children were usually born with the help of a mid-wife. After the umbilical cord was cut, the mid-wife washed the baby and prayed to the water god Chalchiuhtlicue. Soon after the prayer the name of the child was announced. Most Aztec children survived on a strict diet of corn cakes and mothers milk. At the age of three the boys education was entrusted to his father. The father would teach him about gathering and carry­ing wood for the home. Next they were taught about growing vegetables in the floating gardens called chinampas. Then as they got a little older they would learn about trade and the great marketplaces. Also, Aztec boys were taught how to fish, hunt, and maneuver a canoe. The education with the father usually lasted until the age of fifteen. Likewise, little girls were educated by their mothers. From birth they watched their mothers spinning thread, weaving, and embroidering. It was not until they were six that they too could partici­pate in the spinning of cotton. Next, they would learn how to grind the maize and clean the house. The very last thing that they would learn was how to use the loom. Boys dressed in a small cloak until the age of thirteen. Then, at the age of thirteen they were allowed to wear a loin-cloth. Girls dressed in blouses and skirts. The older they became the longer the skirts. All of the lower classes went barefoot. Laziness was severely punished. Some were allowed to attend school between the ages of six and nine years. At the age of fifteen, boys chose between two types of schools. Some might choose to become priests and they entered in the calmecac. Each temple had its own calmecac, and they all worshiped the god Quetzalcoatl. Quetzalcoatl was the god of self-sacrifice. Others may have chosen to enter the telpochcalli schools which were run by the master warriors. The tclpochcalli produced ordinary citizens. Their god was Tezcatlipoca, the god of the night sky who protected his warriors. The majority of homes were made of sun-dried brick. The house usually contained a room where the entire family slept, a small shrine room, and a kitchen that sat on the families courtyard. Bathrooms were built sepa­rately. When the families wealth increased, they added more rooms. Children passed the days playing in the courtyard. Most of the houses were very plain with whitewashed walls and little furnishings. All of the homes were kept warm with wood fires. Bathing was done daily in the surrounding lakes and waterways. They didn’t have soap, but instead they used the fruit of a tree and the root of another plant that worked just as well. 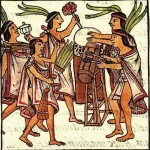 Also, the Aztecs loved flowers, and flowers could be seen growing in their courtyards as well as on rooftops. In addi­tion, family pets were very common. The average family had pet dogs, rabbits, turkeys, parrots, and macaws. Many of the dogs were raised, fattened, and eaten. 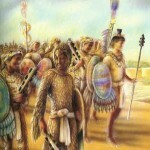 Men dressed largely in loin-cloths called maxtlatls. They kept the loin cloths on day and night. Loin-cloths were wrapped around the waist and then between the legs before they were tied in the front. The ends were often embroidered. Cloaks were also worn by men. They were usually just a simple piece of rectangle piece of cloth tied over the right shoulder. Ordinary people wore simple white cloaks. However, the higher level Aztecs wore more elaborate embroidered cloaks. Noses pierced with gold and gems were also popular. Women dressed in skirts or a cueitl. The skirts were made of a length of cloth that was wrapped around the lower body and tied at the waist by an embroidered belt. Everyday clothes were usually quite plain. However, on special days the women wore colorfully decorated blouses called huipilli. Eyewitnesses tell us about the beautiful clothes that were worn. Clothes were brightly embroidered with flowers, hearts, birds, and leaves. Threading feathers into their hair was also common. Aztec women wore earrings, necklaces, and bracelets on their arms and ankles. 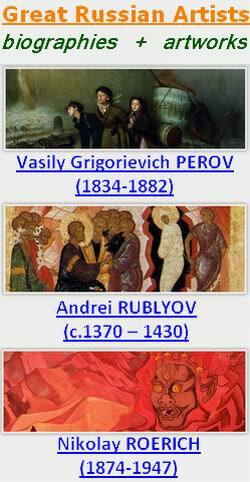 They also pieced their lower lips where they wore jewels, gold, crystal, turquoise, or amber. Mostly, the common Aztec had a very sparse and frugal diet. Primarily, they ate corn cakes, tamales. beans, and ama­ranth. Sometimes they ate wild plants and insects. Usually, they didn’t eat until 10 o’clock in the morning and the first meal was normally corn porridge sweetened with honey or seasoned with pimento. Wealthy men would drink cacao. The main meal rarely had any meat and it was eaten during the hottest part of the day. It was usually corn cakes, beans, tomato sauce, and pimento. Wealthy people had a much more luxurious diet. It included rabbit, turkey, venison, duck. deer. boar, and pigeon. They didn’t have tat or oil to fry with, so almost all of the food was grilled over a lire and seasoned with pepper. The majority of Aztec meat that was consumed came from the domesticated turkeys and dogs. They had a hairless, mute, dog that they raised just for eating. The custom of eating dogs died out when the Europeans introduced cattle. For fun the Aztecs loved to celebrate holidays with drinking, eating, singing and dancing. When they were not cel­ebrating they loved to hunt. Commoners hunted out of necessity. Howeve, the richer nobles hunted just for the fun of it. I hinting birds with blow-pipes was especially enjoyed by the upper classes. Gambling was also a passion of almost everyone. Many gambled until they sold themselves into slavery. Also, the ball game called Tlachtli was played in Tenochtitlan as well as all over Central America. Tlachtli was played on a court with one ring on each side. The idea was to get the ball through one of the rings, however it was very difficult because the players could not touch the ball with their hands or feet.